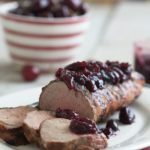 Rack of pork is an elegant dinner, perfect for special occasions, but easy enough to make for a special Sunday supper. With a serving of green peppercorn sauce, this meal is absolutely delicious! Rack of Pork with Green Peppercorn Sauce. For years and years our Christmas dinner was completely, traditionally English. Prime Rib, creamed horseradish, (the straight stuff too) Yorkshire pudding, creamed spinach, mashed potatoes, finished off with an English Trifle. Then one Boxing Day, I decided I didn’t think I could eat beef again. (I’ve since softened on that) My Mom was horrified! Spencer was nervous…I already served so little beef, his Christmas Prime Rib was sacrosanct! There were like…364 days for me to change my mind…but I didn’t. Mom, who has never subscribed to the “family hold back” adage, decided to bring in two main courses for Christmas dinner the following year. Our long standing Christmas dinner guests, Jim, his mom, Camille, Jim’s expat Aussie friend, Fiona and a few other family members would be expecting the “usual”. So Mom came up with a second Scandanavian Christmas menu featuring Roast Rack of Pork with Green Peppercorn Sauce, homemade spiced apples, and a delicious Braised Purple Cabbage. No, we’re not Scandinavian! The Rack of Pork ended up beating the Prime Rib out by nose. I’m generally disappointed with pork loin because it’s been bred and trimmed to be so lean, it’s lost a lot of its flavor. Rack of pork has a nice layer of fat on top, keeping it moist. You can remove it after roasting if you’re so inclined. I choose not to “French” the bones, which means scraping them to make them look pretty. 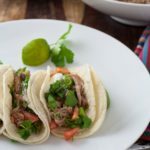 This recipe comes from Ina Garten, The Barefoot Contessa. 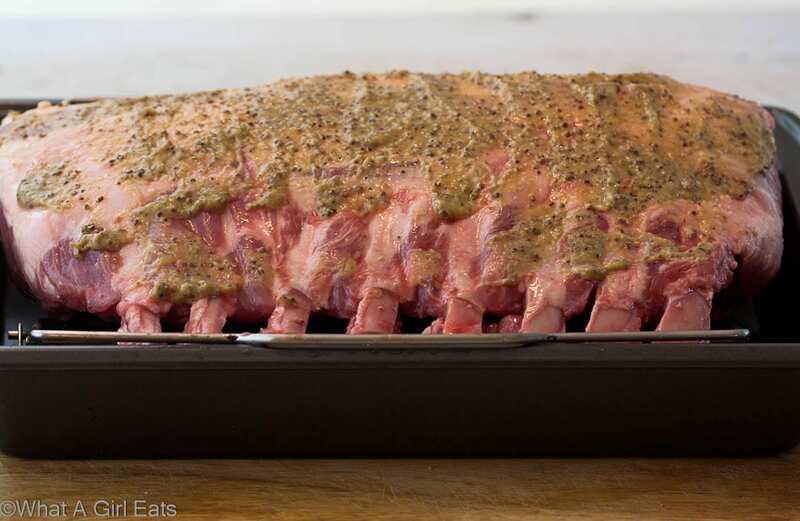 Rack with mustard, fennel rub, ready to roast. Here’s the rack of pork recipe. 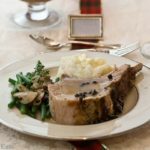 Roast rack of pork with green peppercorn sauce, from Ina Garten. 1 rack of pork bone in, (about 5-7 lbs). Preheat oven to 400 degrees F. Allow the pork to come to room temperature for 30 minutes. Place the pork, fat side up in a roasting pan just large enough to hold it comfortably. In a small bowl, whisk together the olive oil, 2 teaspoons of each mustard, the ground fennel, 2 teaspoons salt and 1/2 teaspoons black pepper. Rub the mixture on top of the pork and roast for 1 to 1 1/4 hours, until the internal temperature reaches 140 degrees F.
Remove from the oven and transfer to a cutting board and cover tightly with foil for 20 minutes, while you make the sauce. For the sauce, remove all but 1/4 fat from the roasting pan. If there isn't 1/4 cup, add enough butter to the pan to make 1/4 cup total. Over medium heat, whisk the flour into the fat and cook for 1 minute. Add the wine and scrape up all the brown bits from the bottom of the pan. Add the chicken stock, remaining 2 teaspoons of each mustard, the green peppercorns, 2 teaspoons salt and 1/2 teaspoons black pepper. Bring to a boil, then lower the heat to a simmer for 5 to 10 minutes, until the sauce is reduced and slightly thickened. Serves 8 generous portions. I served it with mashed or roasted potatoes and homemade applesauce. I'll share the delicious purple cabbage recipe in an upcoming post. Serve the rack of pork with a side of homemade applesauce. 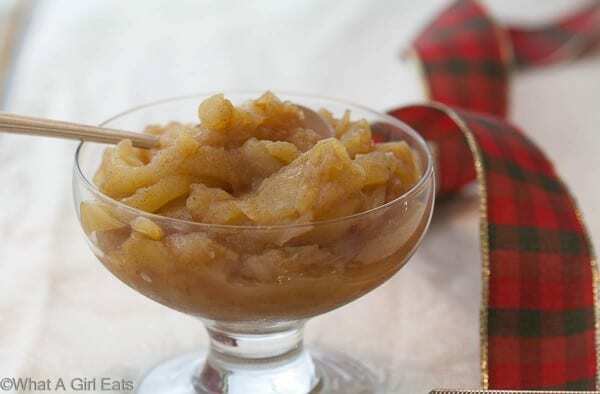 Use a combination of apples for flavor and texture. Combine apples, cinnamon and water in a large saucepan. Cook until tender. Slightly mash some of the apples to leave some texture. 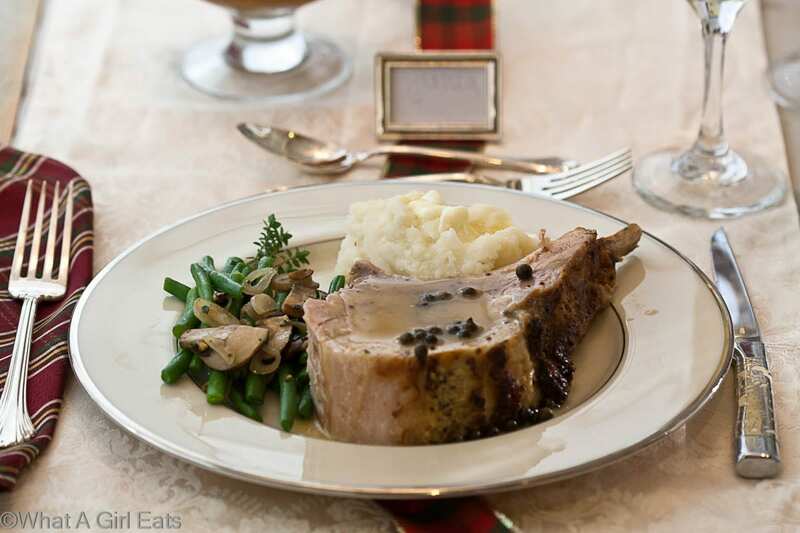 Rack of pork with green peppercorn sauce is a lovely alternative to beef for a holiday meal. I can attest to this absolutely delicious dish. While, I am Cynthis’s cousin family bias does not come into play. WHile I am a capable in the kitchen Cyn is a wizard, no one likes prime rib more than myself, but this dish is my favorite @ xmas dinner. The entire meal Cyn performs should experienced by everyone I would most likely kill if necessary for this prork roast with green peppercorn sauce (I am Scandanavian) Cy’s mom my Aunt Jonne is also a fantastic cook. Thanks cuz! That rack of pork will always be a Christmas staple! 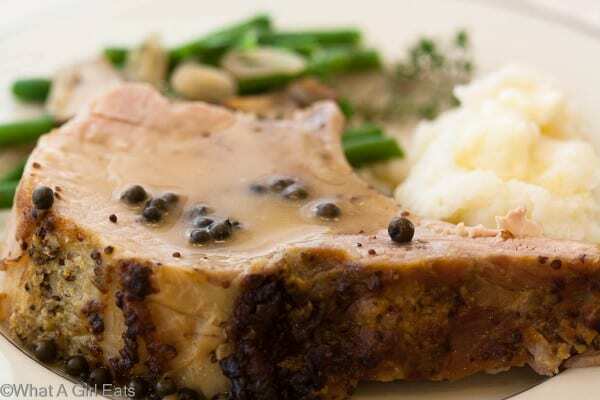 This looks great, rack of pork is getting popular but the peppercorn sauce makes this stand out! The peppercorn sauce is outstanding! I can see why this rack of pork was the winner! Looks so tender and with that green peppercorn sauce – I’m drooling over here! 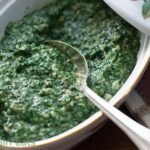 It is so tender, and you’re right, the green peppercorn sauce kills it!